Home » Blog » 7 Convincing Reasons Why Outsourcing Mobile App Development Is Best! Developing business apps is a necessary for the companies these days. From small business and startups company to large companies are looking for mobile app development to grow their business fast. 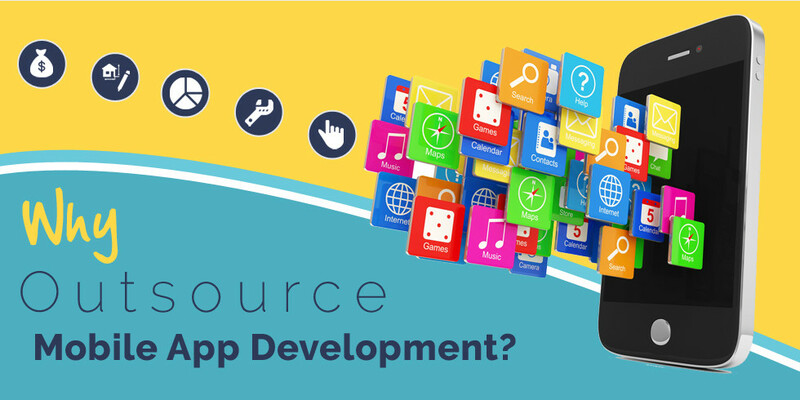 But these companies often stuck on in the question rather they need to develop mobile app inhouse or mobile app development outsourcing is a better option. Outsourcing is a no longer unknown industry. There are many multinational companies (MNC) outsourcing entire work or a part of work to various places like India. And, now every size of business is utilizing outsourcing option and specially mostly all companies outsource mobile app development work. And, to outsource they search best mobile app development company. Business app development requires expertise that satisfies an objective of business within their means this is a one of the major reasons often companies think about outsourcing. If you are business owners who need to develop business app, looking for mobile app development or need mobile app development but undecided on outsourcing mobile app development, read on! as stated business app development requires deep technical skills that allows your business so mobile app development would not time consuming and affordable mobile app development is must. So, it is a better to outsource mobile app development work to expert in the industry. If project duration is too short outsourcing mobile app development is always a wise choice rather than investing in in-house mobile app development team. Top mobile app development companies like Data Cross Solution are known for best handling of mobile app development outsourcing and delivers mobile app development work on time. Dedicated mobile app development agencies that handle outsourcing mobile app development work often use best in the class technology to build a business app. As these top-rated mobile app development companies believes if in business this is important let the best resource to handle it. The best in outsourcing mobile app development is you have option of choice. Business owners has an option to choose developer based on cost, experience, skills, portfolio of mobile app development firm and mobile app development work is assured in safe hands. They know how to let users be addicted to your business app. Classy business app development work has a high chance of outside hacks and malware attacks. Expert in the industry can overcome from this issue. And when business owner utilizing option of outsourcing mobile app development they take toughest security measures and deliver business app after rigorous testing and quality assurance measures. B2B and B2C companies are investing a lot in developing their business app earlier but now a days outsourcing mobile app development is more preferred by them rather than inhouse business app development. Information technology is an industry in which hourly rate and resource cost considerably reduced if business owners outsource to a foreign company. Although, how to estimate exact mobile app development cost is completely different and important. As a business owner it is good decision if development is not your accountability because if you outsourcing mobile app development to a company than development is their bread-n-butter so it is their responsibility to develop a best final business apps, you just need to monitor their mobile app development work. Looking for Outsourcing Mobile App Development Partner? All these reasons are just key take away of outsourcing mobile app development for the companies. When you outsource mobile app development work to a best mobile app development company you earn much more benefits then these. Outsourcing mobile app development is an industry that is thriving due to constant technology innovation and skilled personnel. If you are looking for trusted mobile app development partner for your mobile apps, don’t hesitate to contact us. We are recognized for helping businesses in their successful digital transformation. Top 7 Ecommerce Payment Solutions for Retailers Which Engagement Model is Best When Selecting Software Vendor?